Ekiti State Young Professional Forum(Abuja) a group of Young Professionals from Ekiti State. The Vision of the organization is to engender leadership, recognize and award distinguished Ekiti state indigenes, create sustainable livelihood for young people and encourage the participation of young people in governance and economic process . 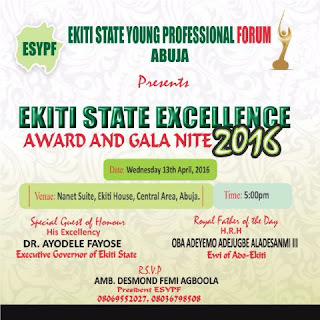 This organisation is set to organise 1st ever Ekiti State Excellence Award 2016 to reward Excellence,Accountability and people who are outstanding in their chosen Careers. Among the Awardees are; His Excellency the Executive Governor of Ekiti State Dr Ayodele Fayose, Dr Kayode Fayemi-Hon Minister of Solid Minerals, Mr Femi Ajayi-former Executive Secretary PTDF,Sen Abiodun Olujimi-Senate deputy minority chief whip,Folarin Falana(FALZ),ACP Abiodun Alabi-Police Head Quarter Abuja ,Mrs Funmi Ajila-Ladipo-President FADAN,Hon Kehinde Agboola, Aare Afe Babalola-Founder Afe Babalola University,Amb Mrs Baiye,Mr Gbenga Aruleba(AIT)and others.